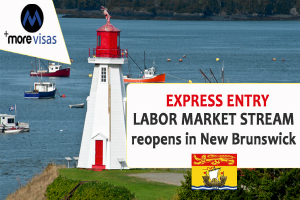 The New Brunswick Provincial Nominee Program has opened for receiving new Expressions of Interest from overseas nationals who are presently working and living in New Brunswick. This Labor Market Stream permits the Government to give a priority to some eligible EE candidates for the provincial nomination. Moreover, successful Candidates who obtain the certificate of provincial nomination in this stream get additional 600 points in their CRS. This facilitates their forward movement to get the ITA for permanent residence in a future draw. •	They must also presently live and work in the Province, in a job classified as skill level 0, A, or B in the National Occupation Classification. •	Finally, they must have a valid Educational Credential Assessment. This must certify that the educational credentials are equal to a High School diploma in Canada.